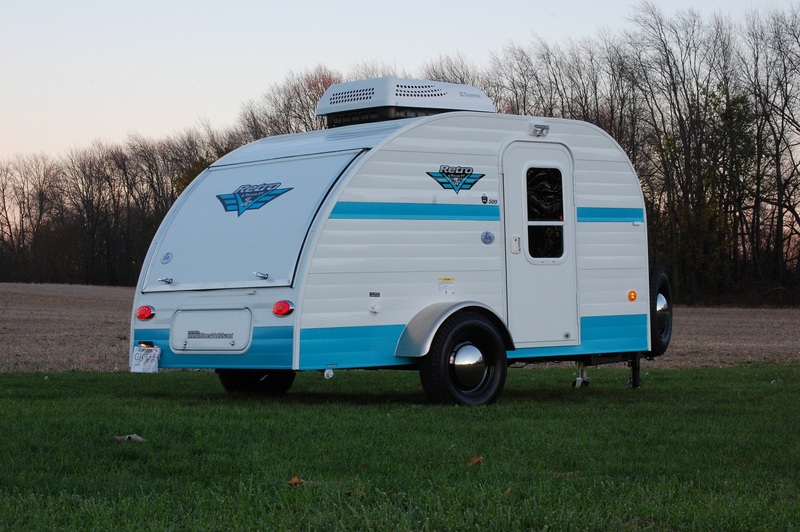 Some ten plus years ago before I ever became an RVer, my wife and I pondered how cool it’d be to get a teardrop trailer one day. 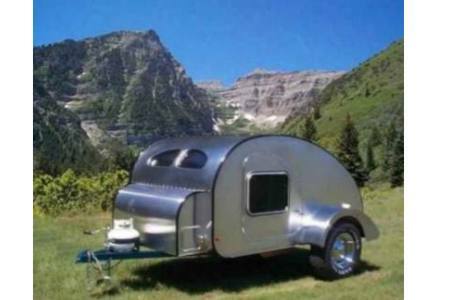 I remember many nights scoping out the various teardrop websites and thinking of how cool it’d be to own the Airstream of teardrops, a Camp-Inn. But reality always set in and that dream kept getting put off until it was virtually forgotten. However, things changed in September of 2009 when over the span of a weekend in Missouri we saw a great looking Route 66 inspired Pleasant Valley teardrop and a Dutchmen T@B. 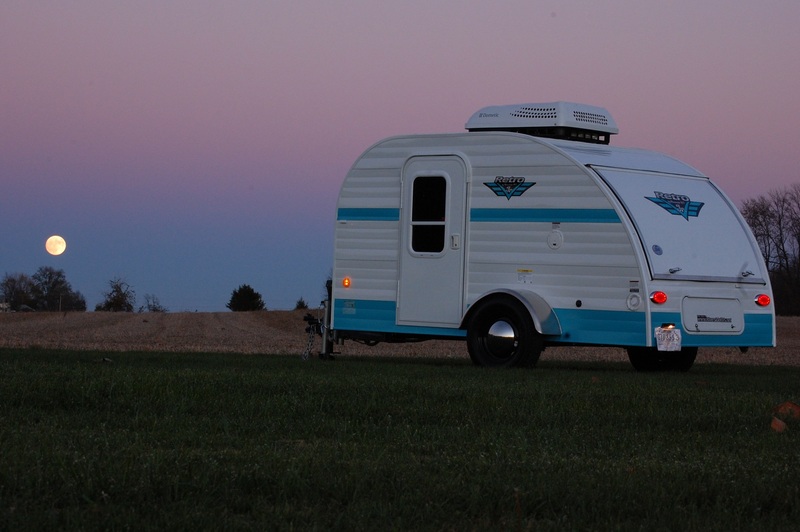 After having the luxury of comparing both a traditional teardrop to a T@B over the same weekend, we discussed the pros and cons of both on our drive back home to Indiana. We decided if we were going to do this, it’d be a T@B, and the following weekend sure enough we had our own T@B sitting in our driveway after a purchase from a dealer in Elkhart, Indiana. As newbies to the RV lifestyle, we soon realized that despite the coolness of the T@B, we needed a little more space…and a toilet. Seven months later, enter a 2010 Serro Scotty HiLander, just about the same size, but with a wet bath and a smidge more space. But as some of you have followed our story over the years, you’ll know that once grandson 2.0 came along, even the Scotty became too small, as we wanted to make sure both of the boys had a chance to have childhood memories of camping with us. 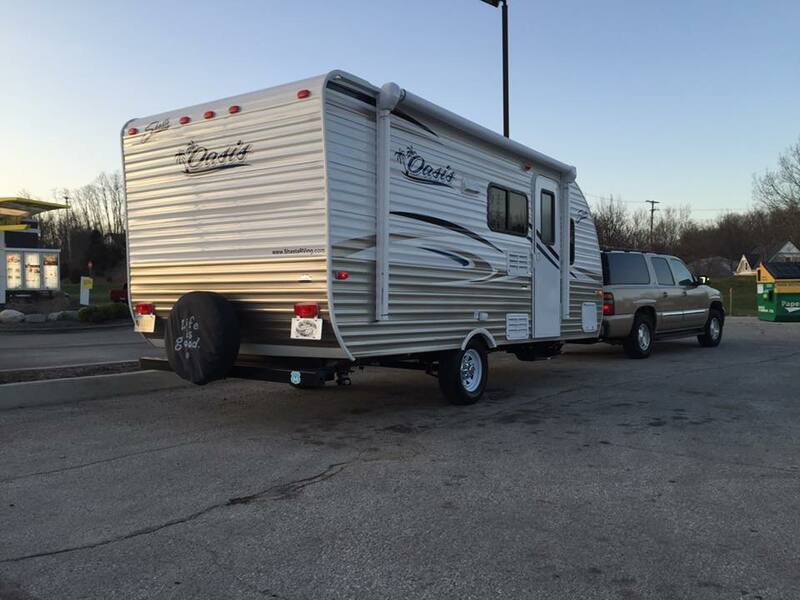 So now we call our 2016 Shasta Oasis 18BH our RV of choice. The Shasta has given us a good family camper with a couple of bunks, bathroom, queen bed…and a vanilla, generic look compared to the T@B and Scotty we had before it. Gone were the days when it’d take me 45 minutes setting up our campsite, as 35 of those minutes were spent talking to a passerby about the T@B or Scotty. No one’s given a second look at the Shasta. I’ve realized that socialization at campgrounds over the trailer I had was a big part of my camping experience, and one I missed. And after my birthday this past June, one which is taking me closer to 50 and farther away from 40, I realized mid-life crisis was in full effect. I had to do something to tame it. And so with my wife’s blessing, we did. 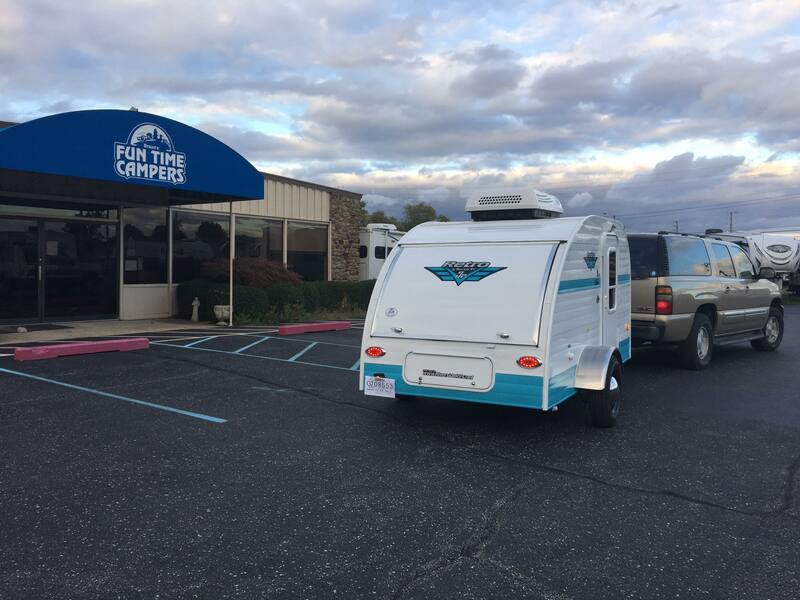 We put an order in on a 2017 Riverside RV Retro, Jr 509 back in late June. I know a few teardrop builders in the industry, and as you can see on our Manufacturers Page, there are a lot of them throughout the country. And make no bones about it, they build some excellent products. However, I’ve had a previous working relationship with Braun’s Fun Time Campers in Indianapolis, a Riverside dealer. After inspecting some at their dealership, we soon realized the Retro, Jr gave us what we wanted at an excellent price point. Riverside offers a few color schemes to choose from, but after going back and forth on what we wanted, we realized we needed to go with the white with aqua trim with baby moon hubcaps to pay homage to our former Scotty. But on our first camping trip a couple of days after we took possession, it was like old times. At a busy Starve Hollow campground, it got its share of looks and even some pictures. And once we start taking it out more next year, I’m sure I’ll be speaking of its virtues to any fellow camper interested. Now for the nuts and bolts of the Retro, Jr. Total length is 13’9″ and dry weight fully optioned is 1,023 lbs. 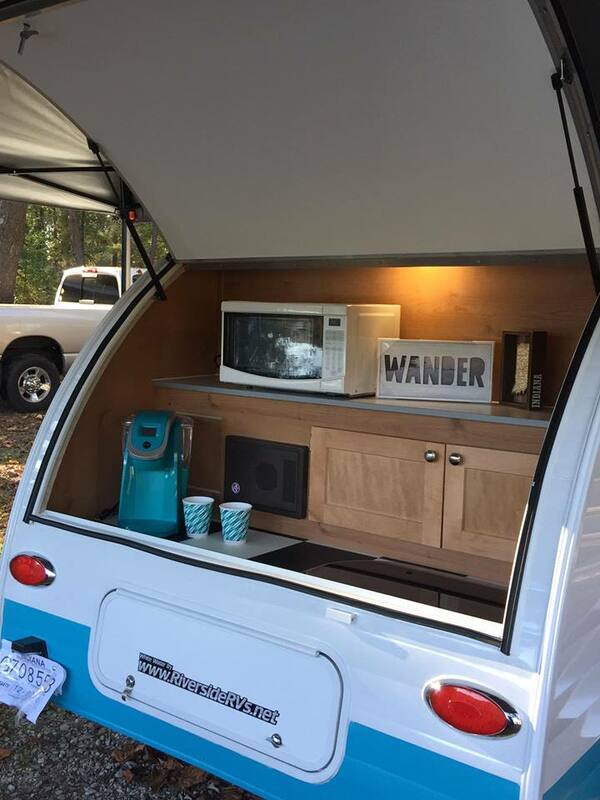 Those options we ordered are air conditioning, sink/stove combo, spare tire package, electric brakes, and a few other minor ones, including a USB/12 volt charging port and solar prep. One thing I did get on my own was a mountable jockey wheel at Menards for about $25 that swings up or down, depending on whether you’re hauling or ready to move it by hand. The interior bed dimensions are a nice 60″ wide and 76″ long, more than ample enough for two average sized adults. 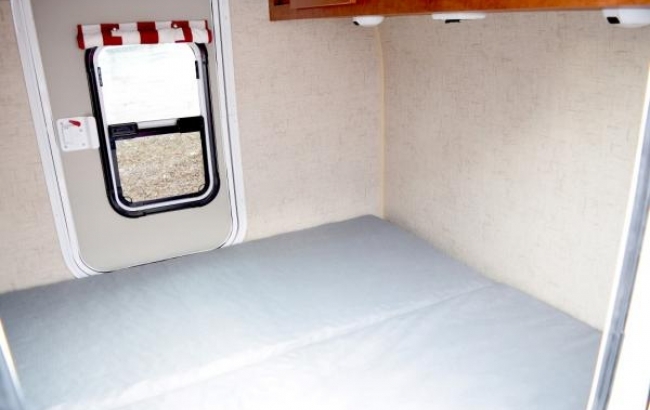 We added a 2″ memory foam mattress topper from Walmart for some extra comfort. 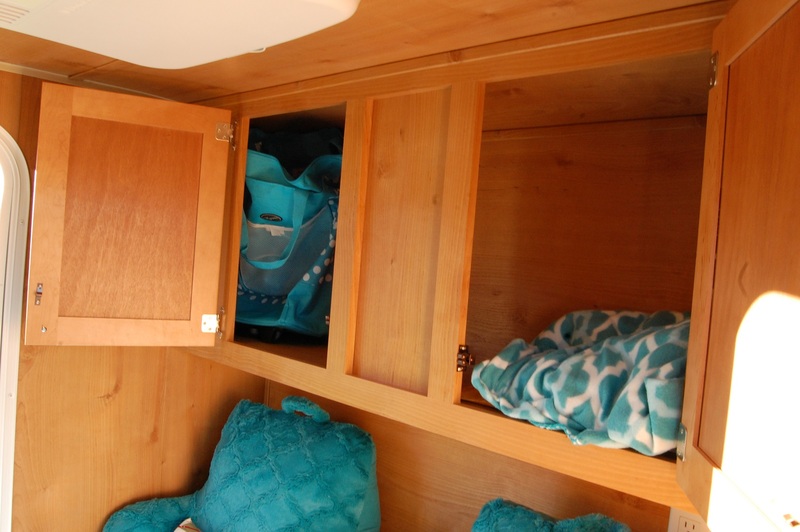 There are also storage cabinets on the front and rear interior walls, with the rear cabinets a little bit longer than the front, but both sides large enough to handle your typical bags for clothes you’d bring on a weekend camping trip. The Retro, Jr is now decked out with all LED lighting, inside and out with the exception of the over the door exterior light. 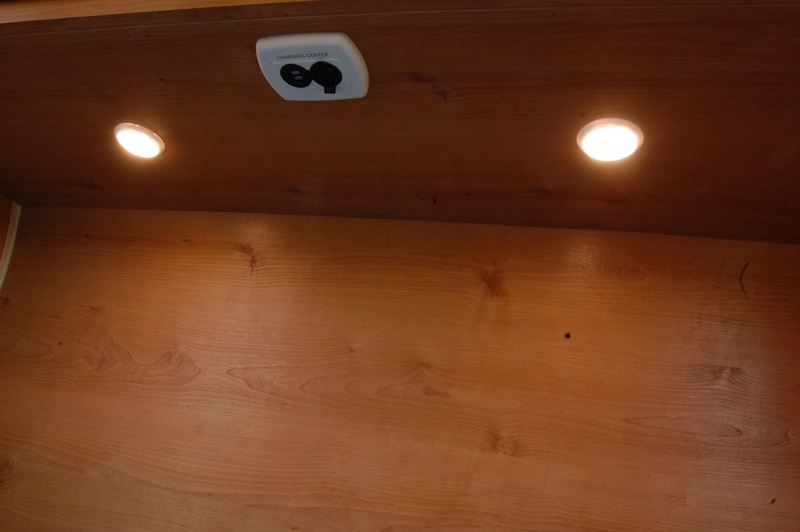 There are two main overhead lights as well as two reading lights underneath the front cabinet that are on either side of the USB/12 volt charging station. The air conditioning unit is more than adequate for anyone in just about any climate. 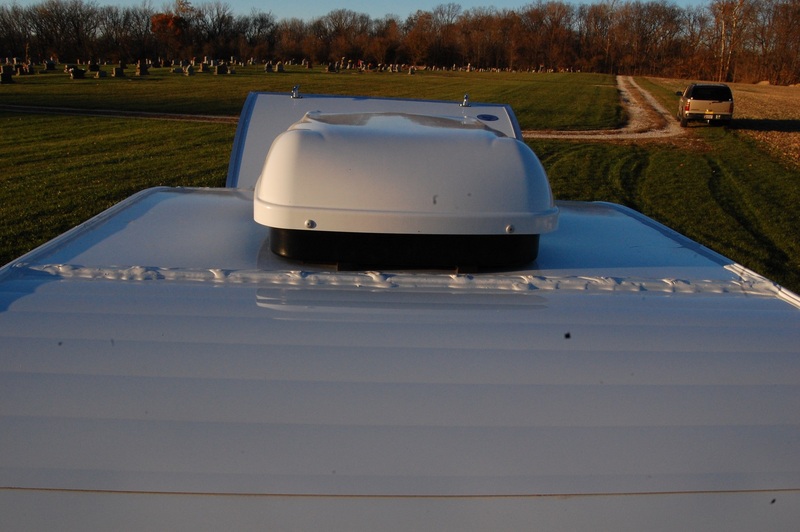 It was about the time we ordered ours in June when we were informed that Riverside had done away with the interior window-unit style air conditioner in favor of an 11,000 BTU roof mounted Dometic unit. It should be interesting next summer to see how it does in really hot weather. Moving to the rear kitchen area. 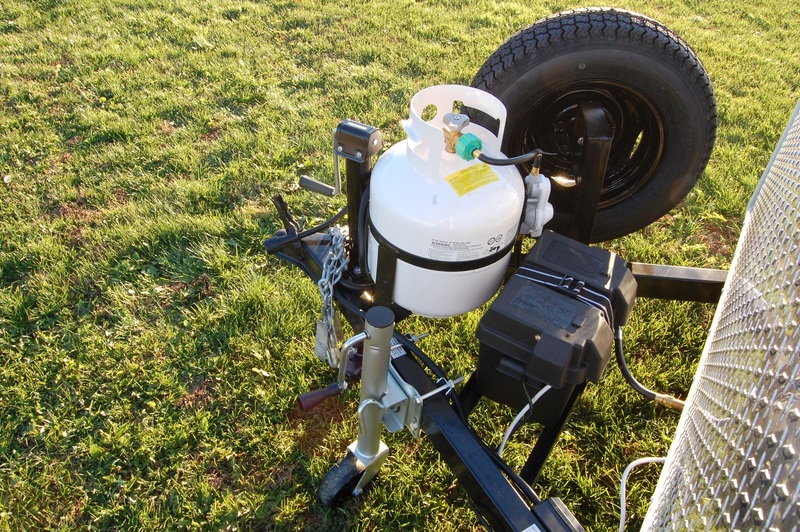 With going with the sink/stove combo option, that also meant we’d have to have a 5 gallon propane tank on the front, and in the rear hatch, we’d need the 17 gallon fresh water tank as well as water pump. 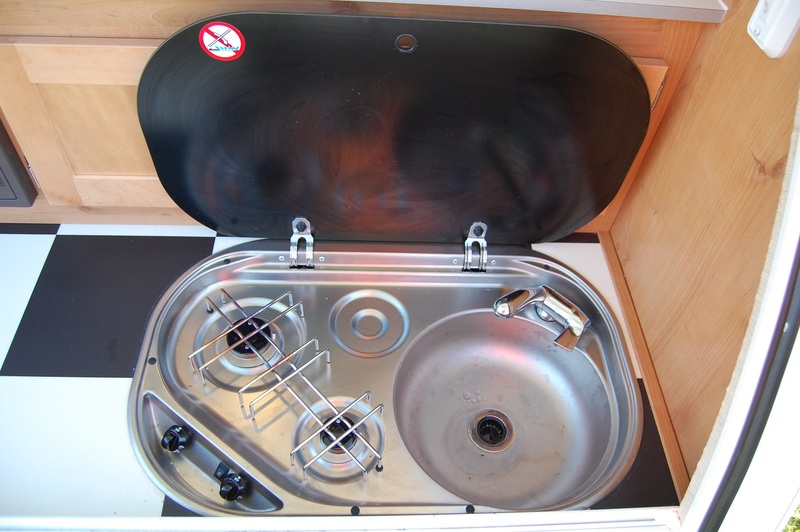 But should you decide not to get the sink/stove combo, the entire rear storage area is yours, as the fresh water tank and water pump wouldn’t be included. The rear kitchen area offers ample counter space, an electrical outlet for a microwave, coffee maker, or any other electric kitchen device, as well as a decent sized cabinet for utensils and other small cookware. Also included is an LED light for those late night cooking ventures. Kind of a no brainer to go with the wood grain/checker board look for about $300, don’t you think? 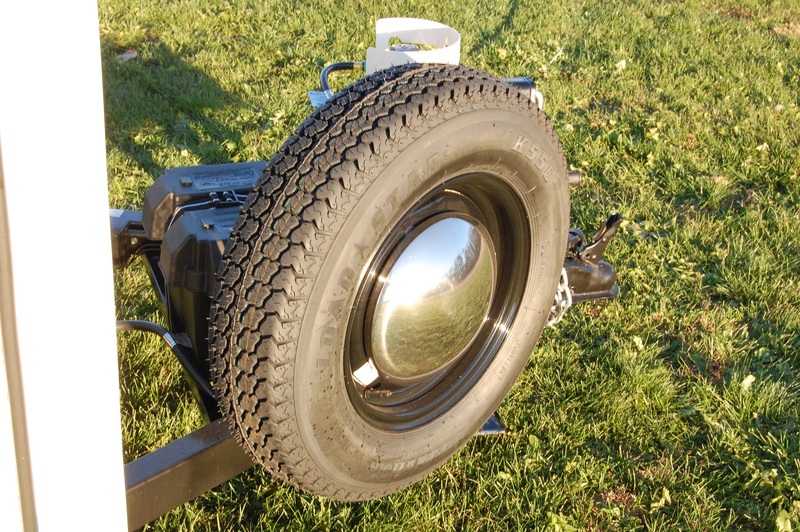 Now back to some specs, the Retro, Jr sits on a 1500 lbs axle, supported by two 13″ wheels. The underside is enclosed by the usual black Darco material to keep out moisture. The 30 amp power cord could be a little longer to suit me, so be prepared to purchase an extension for it as it’s probably about 15′ long. Construction-wise it appears to be built pretty well. It’s got an aluminum cage with a steel frame, aluminum sidewalls and a fiberglass roof. It tows extremely well and at just 1,023 lbs, can be towed by a lot of vehicles. As you can tell, this is a teardrop with doors on each side, which isn’t always the case with some manufacturers. Each door has a deep tented, vertical sliding window for some good cross ventilation and are draped with color coordinated shades for privacy. The one drawback with going with the rooftop air conditioner is that it eliminates the possibility to have an A/C as well as a roof top vent fan. However, a Fantastic Fan is standard if you don’t order the A/C. And one other request I wish I would’ve made is to have an exterior porch light over each door, as they only put the one over the curbside door. But overall, it appears to be a solid trailer with a good build quality. And coming from me, that says something, as I was rather critical of Riverside’s sloppiness on their Retros when I first saw them at the RVIA trade show in Louisville in 2011. However, in subsequent years, I commented on how they seemed to have got their act together on fit & finish for this price point, and the fact that I’m buying from them should show how much I believe in how they’ve improved. Depending on where you are in the U.S., you can likely expect to see a Retro, Jr fetch an MSRP starting in the $9,000’s, but your results may vary. I’ll keep you all posted on how things are going on it in the near future. And if you’re wondering, yes, we are a two-trailer family. 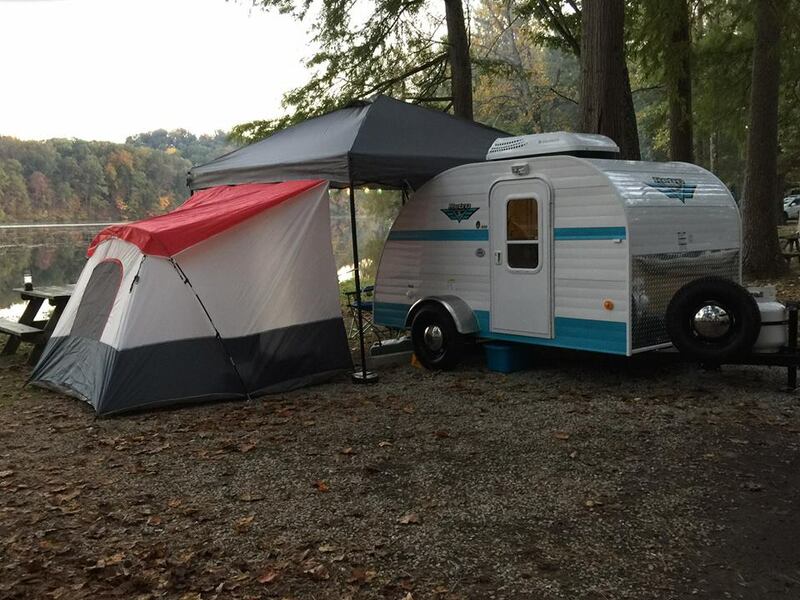 We’ll be keeping our Shasta for when we take family trips with the grandboys. But the Retro, Jr is for me, or me and my wife to play with. I kind of liken it to this: The Shasta is kind of like a minivan that a guy has to drive throughout the week. And the Retro, Jr is that guy’s sportscar that he drives on the weekends. Hope you follow that analogy! I’ve put together a walk around video of it that you can find below. Feel free to shoot me any comments or questions either below this post or on the YouTube video. As always, thanks for reading. Cool trailer! Very interested in finding a “trailer jockey” like yours; could you post a link to the specific item? We’re looking for a way to maneuver our T@B on gravel and need a bigger wheel. I am very interested in getting a Riverside Retro, Jr. but I am tall and so is my husband. I have not been able to find anything about the head clearance on the hatch for the galley. I for see lots of head bumps for myself at 5’11” and my husband at 6’3″. Is the clearance high enough or is it out of the way completely? I haven’t found any pictures with people standing at the galley. I’m 5’10” and there are no issues. I’m not sure of the exact height, but you’ll be fine. I just put money down on the same unit. How are things working out with the A/C unit. It seems kind of large in both BTU and weight. I am trying to figure something else out. John – Since we got it in October, we’ve not had a chance to use the AC yet. 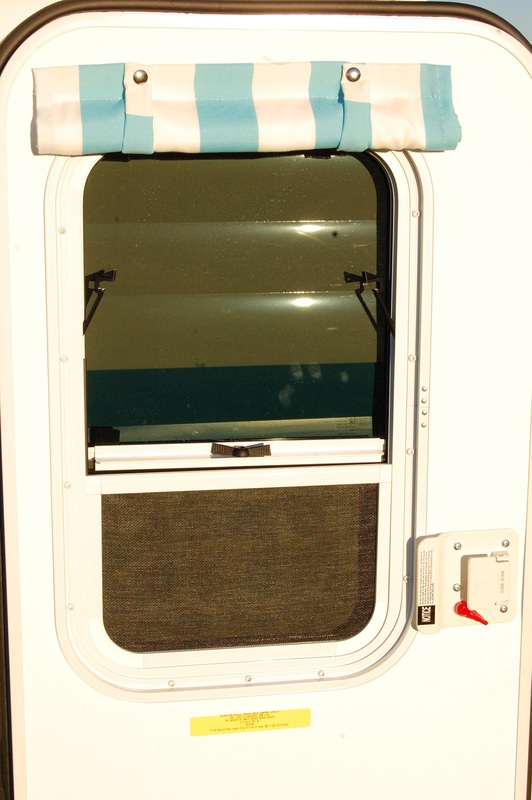 If you check on rvtrader.com, there are still some of the 2016 & 2017 models that have the old AC setup, which was a 5K BTU window unit mounted on the inside between the cabinets. Jason – Fear not! We do have the pillows in the correct location. I just put those two back rest pillows down by the feet for aesthetics. ive noticed that we appear to have started a trend when we asked for the birch interior. If you go to rvtrader.com and search for Retro juniors, you’ll see all the recent ones hitting dealer lots have the same interior. Did you take it winter camping? The one I am looking at has the arctic package and I was wondering how warm it felt inside. Eileen – Didn’t take it winter camping, but I did sleep in it a few times in the garage in sub-freezing temps. The electric blanket did wonders! Mine doesn’t have the Arctic package, but if you can get it with, it’s certainly not going to hurt, but just not sure how much it helps. We are looking at a buying a Retro Jr. 509 very soon. We will be towing with a Subaru Outback, but we have to have a trailer hitch installed. Is there a particular size ball hitch that we should ask for? Also, in your experience, how easy/difficult is it to reach the GVWR? We are worried that with full water we will reach the limit too quickly with all our “stuff'”. Thanks for your blog and video-it really helped us determine what we were looking for! Aimee – The water tank in the Retro, Jr is about 17 gallons, so if full, you’d be adding 130 lbs or so. I think the cargo capacity on mine is 400-some lbs, so I don’t think you’d have much to worry about as far as loading up the trailer itself. It does require a 2″ hitch ball, so plan accordingly. There’s not a ton of storage in one for anything other than a weekend’s worth of clothes, plus your pots, pans, coffee maker, etc. Pat we are considering this camper too. Have you heard anything more on Serro Scotty Sportsman? Do you know what the weight on that one might be. Kourtnie – The Sportsman WILL happen. I was invited out to their factory in Pennsylvania a couple of weeks ago and the Sportsman is in the very early stages of development. It will have a lot of similarities to the originals, but with modern amenities. I know a couple of years is a long time to wait, but Liberty Outdoors has a lot of projects coming down the pipeline that we’ll see over the next two years. If you can wait that long for everything they have in store, you’ll be impressed with the various selections. Thanks for your review of the Retro Jr. 509. How well insulated is it? What are the R values of the floor, walls and ceiling? What is the Arctic package? Is an order form available that has information about optional upgrades and their costs? 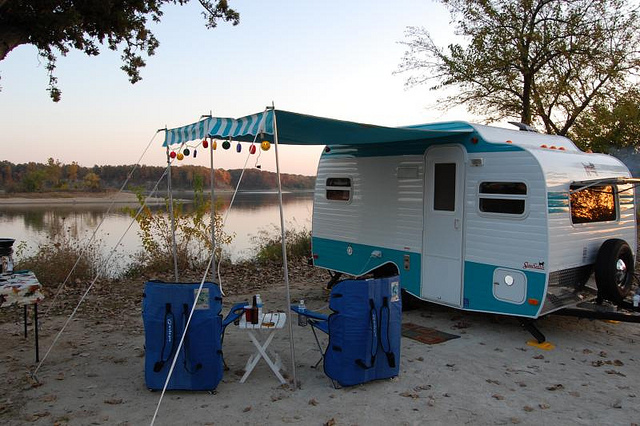 We just picked up the same model/color… I’m curios if you have a side tent for it? We’ve been looking all over and even considered the PahaQue Tab Tent, but since the Tab is bigger, I’m not sure it will work. 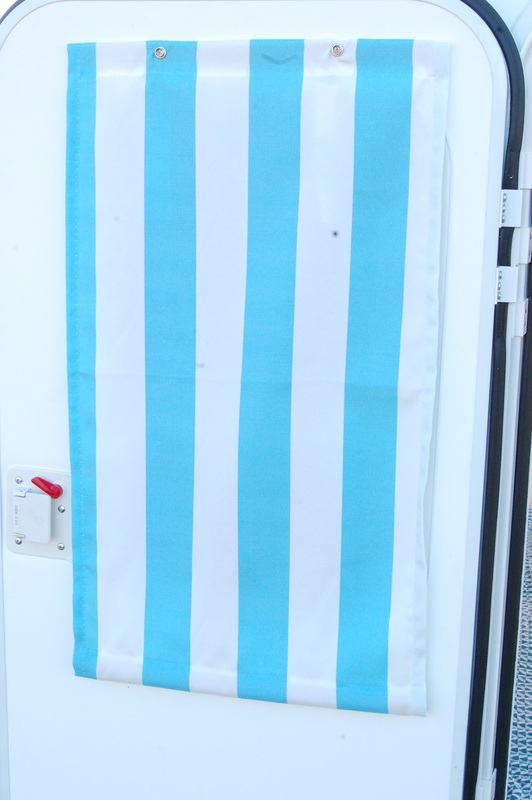 Ideally we’d like one we attach to the side of the trailer that will keep out rain, but also has a floor. We rented a Tab last summer and took it to the Olympic Peninsula. We had just a normal screen tent you would use for picnics in a park, but it rained a couple of days and since we were on a slight incline the water would roll over the ground under our feet when we were hanging out in the enclosure. Which meant our dog wasn’t able to hang out with us in his bed without it getting soaked and our feet and shoes were all pretty wet as well. Any suggestions/thoughts would be appreciated! And thanks for the in depth rundown. This posting was one of the reasons we bit on the Jr! Is it possible to sleep on the bed when it is folded up in half? Curious if a single person could sleep without unfolding? inspect / work on it’s position within the RV ? 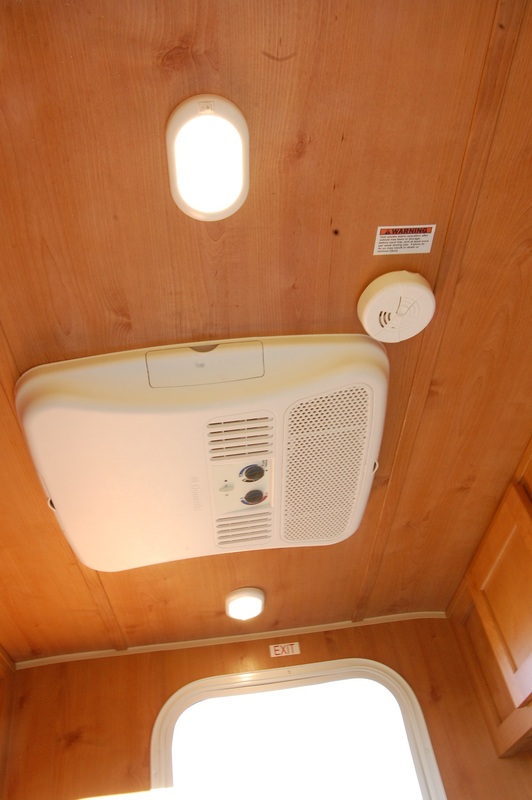 I am thinking on replacing the A/C unit with a $99 dollar one from Walmart..
Can anyone tell me about the Nest Egg Teardrop trailer . I was ready to order one but could not get any answers to the questions about options etc. I really liked what I read on their website but could never get an answer when I called their number. E-mailing got an answer but only to give me another phone number which was never answered. My messages never got any response . I decided that I would need to go else where due to very poor customer service, since I did not want to risk this despite really liking the teardrop. I would love to find a used one to purchase but have seen none for sale ( over several months looking ) . Just wondered if anyone else has had similar problems with this manufacturer or has one to sell . 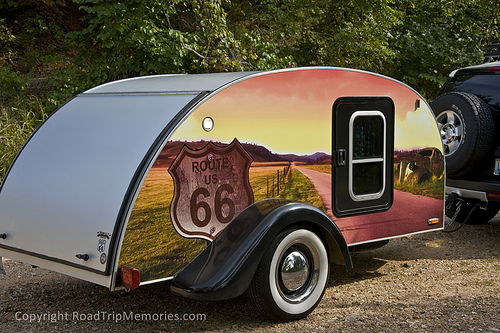 Also does anyone know of a similar very light weight ( preferably fiberglass) teardrop trailer. I do not want bells and whistles, but want solar if possible . Thanks. Glad I found this site , Very informative. Try a MyPod. 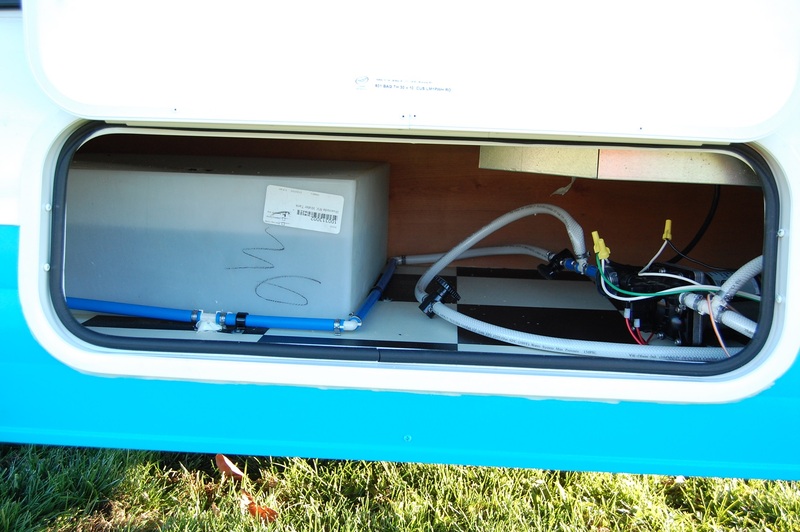 Simple design, super easy to tow, comes wired for solar. I have the exact retro jr and love it!…. I am looking for a side tent….the one in the photo ..the red and grey…what is it and where did you get it? Great info.. looking at Riverside retro ourselves.. Do you have any trouble swaying when pulling on highway? You can buy a kit such as GoPower and just plug it in to your outside solar ready plug. They have a built in controller on the panel that tells you how much power you are drawing and how much charge is left on your battery. I purchased a second battery so I have lots of storage and mainly run 12 volt appliances or led lights when Im boondocking and not plugged into hydro. Hope this helps. I have a 2016 Retro Jr. 509. teardrop trailer which weighs in at 920 lbs dry and probably around 1200 lbs fully loaded with gear and water in the tank. Its super lightweight as it has an aluminum cage on a steel frame which is the exact reason I bought mine. I tow it with a 4 cyl. Toyota Rav4 that has a towing limit of only 1500 lbs. Your options for working on your computer (Im assuming laptop) would be sitting in your bed, you could use a little folding table tray as a desk or just in your lap. Ive seen teardrops retrofitted with a pullout or drop down work table mounted on the interior so you could design what works for you. 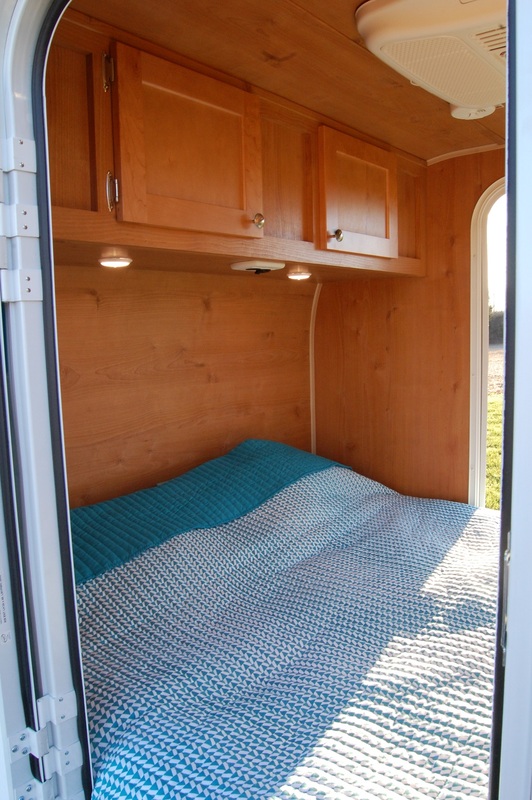 Also you could fold the queen mattress in half so it is a thick single and more like a couch/daybed with throw pillows across the back…..which would give you floor space for a folding table in front of you like a desk. I chose this trailer because I didnt need/want the bells and whistles of radio/TV or AC. I find the fantastic fan does a great job of drawing in cold air with side windows open…and on clear nights when it is fully open I can see a few stars. I picked up an 12×12 Easy up canopy to cover back kitchen area to provide shade and cover from the rain so I can also have sheltered outdoor space in inclement weather. My teardrop was solar ready so I just picked up a GoPower solar package that I plug directly into the outside plug of my trailer which recharges my deep cell batteries or they also charge on the go when I am driving. If you like the appeal of the teardrops and want to stay well within your towing limit…..I would say its totally do-able. When Im not travelling around mine is parked outback by the firepit and is a great retreat or extra room for guests. I have even overnighted in it in the winter during subzero temps…..with a small ceramic heater/ electric blanket setup when plugged into hydro or a 12volt mattress pad when running off my 12 volt. I am having so much fun with this little trailer that Im thinking of possibly taking an early retirement and travelling fulltime for a year in it. Deanna, I am also a single woman. I have a teardrop but not this make. I put a cot in it so only half is used as a bed. This gives me storage under the cot. Then the other half I have a portable toilet and a small folding table. I can sit on the cot and work on my computer at the table. What are the inside dimensions of the Retro Jr. 509? It looks taller on the inside than most other teardrops. We bought our 2017 Retro Jr 509 in February of 2018. We have had it out 14 times. (yes, we count how many times we take it out) We can’t say enough good things about it. Everywhere we go, everyone wants to look at it. We stopped in the middle of nowhere in New Mexico on our 7 day vacation and had a couple of women and grandson approach us and even wanted to take a pic of their grandson sitting inside it. How can one say no to that? We have had to the beach and used my generator, had it in Sipapu New Mexico, and had it KOA camps. The one negative thing I have to say is that the A/C is so good that it freezes us out in a manner of seconds. Once we “discovered” the thermostat, it worked great. The noise is quite the distraction when we are trying to sleep so we decided to only camp in the fall, winter, and spring. I paid $7500 for it and would spend it again. Do your homework and you can find a good deal. So I’m looking at buying in Canada a 2012 Riverside Whitewater Jr. 509 . Wondering what the lights inside work off if? The deep cycle battery ? Which I take to mean it is not a car battery … is it a marine one? What size would you need to have to use fur reading lights inside? What powers the 2 burners in kitchen … the propane is hooked up to it ? If you don’t have electric hook up at campsite etc does that mean you can’t use electric outlets for say a kettle to boil water ? Appreciate any and all help in these questions . Oh, your electric blanket would work off of … the deep cycle battery??? I am curious about the toilet comments from earlier in your article. You learned you needed a toilet but now you’ve gone back to no toilet. Tom – We’ve since sold the teardrop, as we found we weren’t getting our money’s worth out of it. However, we still have our 22” Shasta bunkhouse. 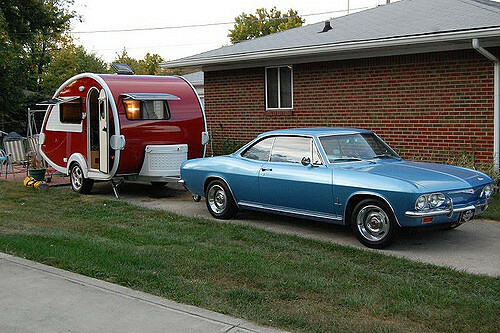 We knew having a teardrop be a typical stick & tin trailer meant it was a different style of camping. Since the teardrop was a lot smaller, essentially a bed on wheels, we knew it would be different than camping in our Shasta, which we were fine with. So that’s it in a nutshell. If we knew we could get out more, I’d get another one in a minute! What size ball would this take to tow? I just ( Feb 7, 2019 in the middle of our winter) purchased a 2015 Riverside Whitewater Retro Jr. 509 from a few provinces away here in Canada. Cannot find ball size anywhere . Had 2 13 foot Bolers in past and trying to remember ball size ( thinking 2 inch or 1 3/4 maybe) will be travelling to pick up our new second hand camper and need to know ball size. Gail – It’s a standard 2”. Congrats on your new purchase!